Alex Broad – Finally, I did it! After a long obsession with catching a cook straight sailfish (barracouta) on fly I finally managed to land one on the weekend. This is one species that no matter what I’ve tried in the past I’ve had absolutely no luck with. Saturday was an awesome day weather wise, Our storeman Leigh is an avid saltwater fisho and offered to take me out on his boat for a session on the gurnard in the harbour. He was slaying the gurnard on soft baits, so I pulled out the fly rod. The first couple casts and drifts were uneventful, but then I hooked into something, only to loose it. The teeth marks in my leader only meant one thing. Wire bite tippet applied and a new flashy fly, a few casts later I had one hitting the fly but my strip strikes weren’t connecting. 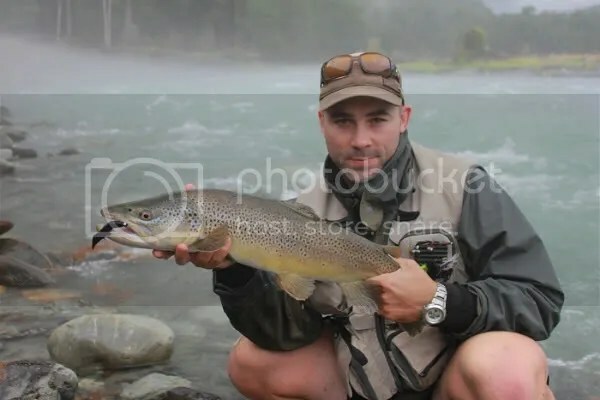 Finally, at my feet he took the fly on the surface in one of the most ferocious takes Ive ever had fly fishing. 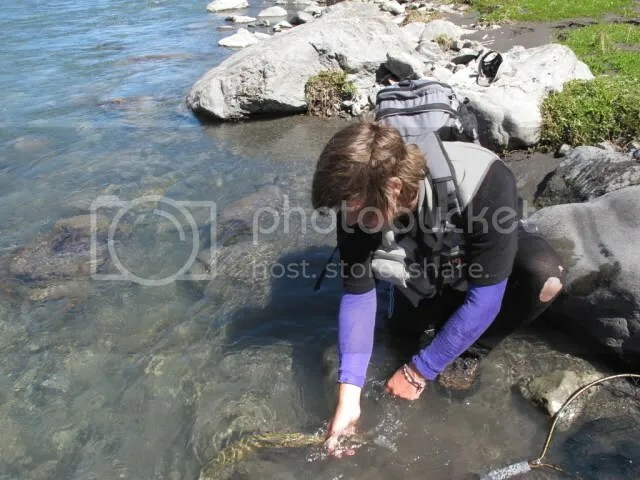 He then managed to take my entire fly line in seconds, I got most of the line back almost as quickly, before we landed him in a rather unorthodox way, care of the anchor rope. Not the biggest couta in the sea, but I was stoked to finally get one under the belt. I will in no doubt be attempting to catch a few more over the winter. October 2010. The day before Labour weekend. We had been here a week earlier, but there was already a car in the carpark with a note saying they were fishing where we wanted to go, so we went elsewhere. We came back, and this time were first on the water. It was a huge day, but it was well worth the effort. Look out for a special guest appearance by Jacks GTC nymph at around 5:32 in the clip! Andrew Hearne – The power of purple! Jack likes wearing it, I like fishing it. Earlier this year I was fishing with a mate Lionel. 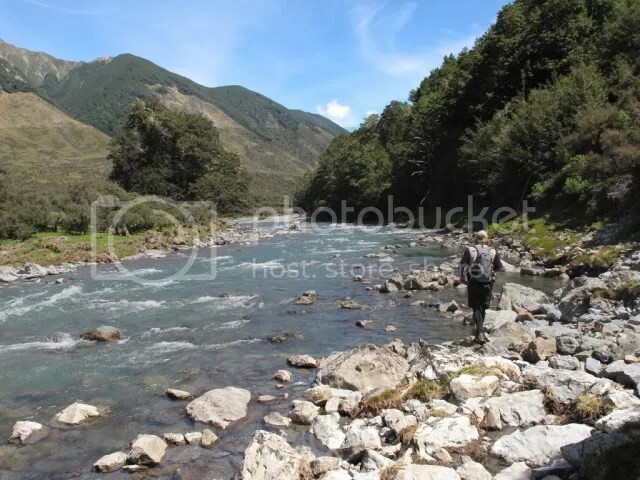 We walked about and hour and a half into our destination river, with a fair portion of the walk following a tributary. As you can tell by the pictures, the conditions were less than ideal. On the way in we found the tributary to be very high and milky. Not good, but we had come this far and decided to push on to the main river anyway in the hope that it would be fishable. Along the way we miraculously saw a fish holding right against the near edge. 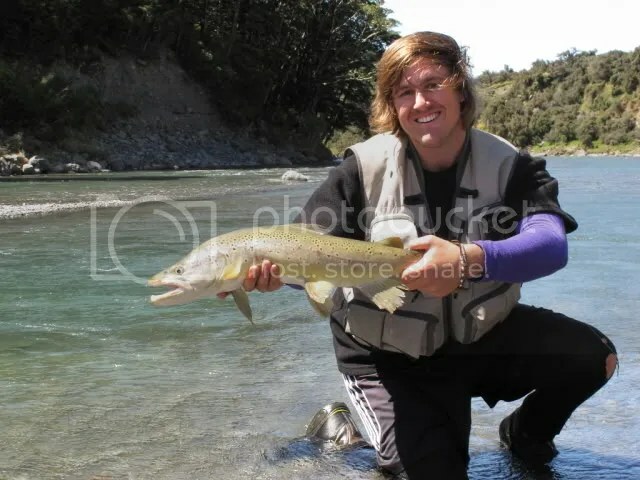 In fact Jack had told me of this fish after seeing it there a week or two earlier. 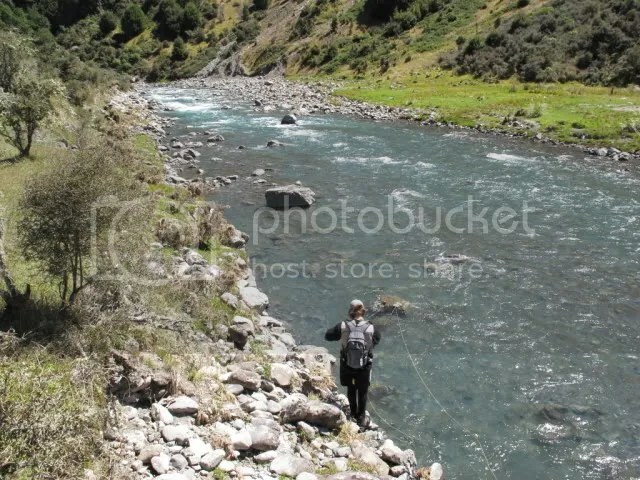 Lionel set up his rod and climbed down to try and catch the fish. 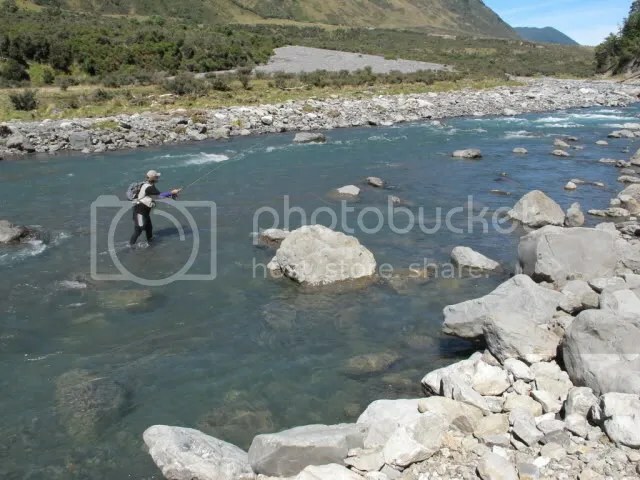 After several fly changes the fish eventually disappeared off into the milky torrent out of sight, and we carried on down to the main river. Unfortunately the main river wasn’t a happening thing. If the light had been better we would have managed, but it was very overcast and we were both of the opinion that the better option would be to bug out and try to find some cleaner water nearby. We came to where the fish was on the way down, and saw that it was back holding in it’s original position. This time I fished for it, after Lionel refused and threatened to throw a stone at it if I didn’t. At first I tried a big terrestrial, followed by a few other nymphs and dry flies. None of which prompted a response. 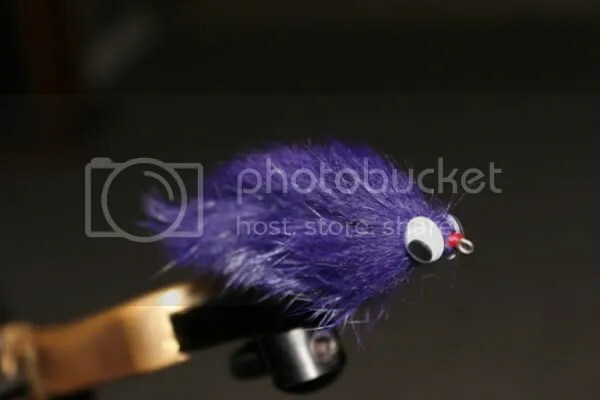 Just as I was close to throwing a rock at the fish myself, I decided to try a purple double bunny I had tied a few months earlier. The bunny drifted past and the fish got angry. It looked for all money like the fish had just tried to kill my streamer, however it missed the target. The next drift produced a similar response from the fish, although a little more subdued. At that point I changed to a black version of the same fly. No reaction. Changes to other streamers also proved to be unsuccessful. They got no reaction from this fish at all. I decided that it was time for some purple power again. Once again, the first time the purple bunny went past the fish it tried to kill it. A couple more drifts with similar results and I decided to try a different approach. I crept along the bank to a few metres upstream of where the fish held. I cast out into the current and let the bunny swing right in front of the fishes nose. It didn’t hesitate and absolutely smashed the purple creation that was invading it’s personal space. I was surprised to say the least, but I remembered to set the hook and after a very short battle Lionel lifted a net full of Brown Trout. Neither of us could really believe what had just happened. I’d come very close to giving up on that fish on more than one occasion. It just goes to show… you never really know. The next video clip will be posted soon. Keep an eye out for it! 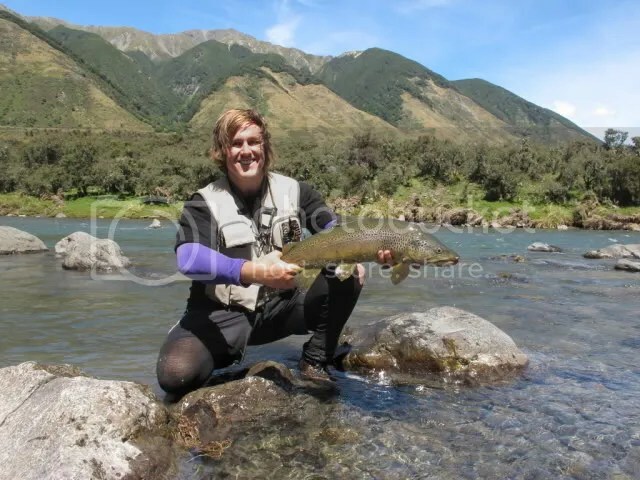 I managed to get an afternoon fishing before showing our 2011-2012 fly fishing range to the Taupo/Turangi retailers. 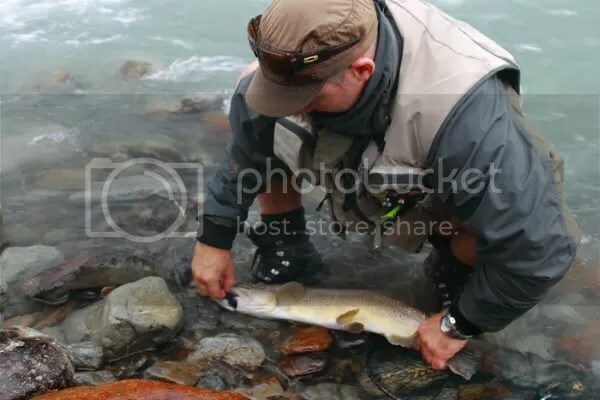 Richard Dobbinson our mid-upper North Island sales rep and I enjoyed the mild weather and managed to land 4 good fish and lost another few. I even managed to try the stupid planking craze! Jack Kos – Ci. Ca. Da. 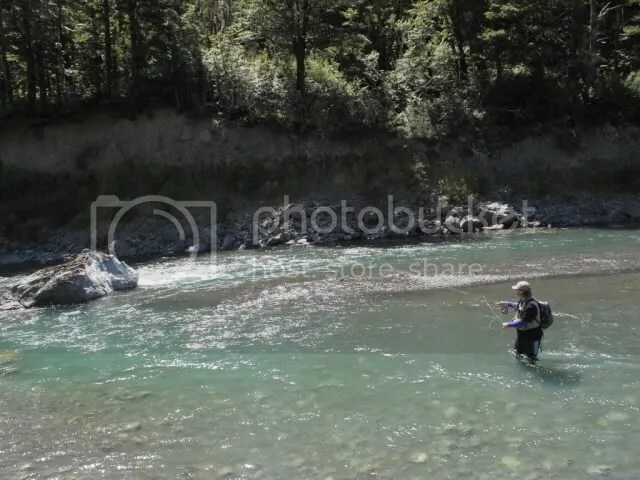 Back in February I spent a day fishing a backcountry river with a couple of South African guys. Actually, only one of them survived the walk (it isn’t short…). Oh well, more fish for the two of us to fish to. Phil was the survivor, and he turned out to be a really top guy. Plus he could fish. Things started slowly. 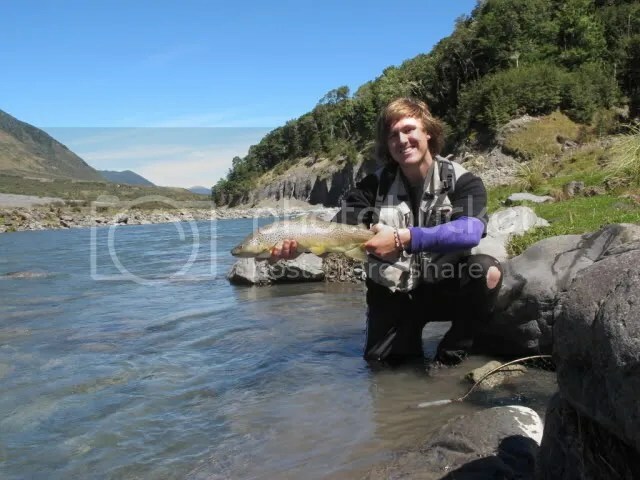 We were fishing a coloured river, and although we could see fish they weren’t active in the cold morning temperatures. It wasn’t until the sun was a bit higher in the air that things started to change. It was like a switch flicked and flicked good. After lunch we fished to about 15 fish and hooked every single one of them. There was nothing small either. It was just magic. I dream of days like that. Oh, and the fly? Lets call it Andrew’s take on a cicada. Christ does it work. As for me? I suppose I did alright. Caught in the same lie that I pulled a much bigger fish from earlier in the season. A casual cast revealed that this was not, in fact, a rock. Last cast of the day. What a way to finish. That was only about half of the fish from that day, it was truly spectacular. It’s days like this that I look back on with envy as I study for exams. No idea what’s happening with Uni after these latest aftershocks (btw hope that everyone out there is ok! All safe and sound at the wunder-flat). Apparently they’re letting us know tonight, but that doesn’t make it much easier to motivate myself to study. Andrew’s got a report for you guys coming up in the next week or so with another video from our season. 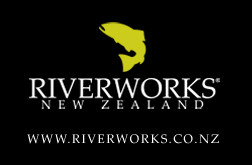 One last thing – if you haven’t already then join Riverworks (at http://www.facebook.com/riverworksnewzealand) and TwoTroutBums NZ (at http://www.facebook.com/twotroutbums.newzealandflyfishing) on Facebook. That way you’ll stay up to date and get all the good oil asap. Saw this video when I was procrastinating. I think it sums fly fishing up very well. Gorgeous cinematography, awesome fishing, but at the end of the day just about two guys getting out there and having fun. Have a great Fly Box? Connect with us on Facebook and upload your picture to be in to win! Competition ends on 15th June.